[GUIDE] Scale and your map. Discussion in 'Tutorials & Resources' started by grazr, Apr 4, 2010.
horizontal scales in TF2 maps. vertical scales in TF2 maps. Scale trends in official maps. ways of increasing scale consistancy when developing your map layout. Some hard figures to consider when blocking out your maps layout. Some theory on TF2 gameplay and class mechanics that influence the scales we will end up using. Let me begin by saying these are guidelines and hard statics only. Using these scales “by the book” will not guarantee an enjoyable gameplay experience on/in your map, and no single layout design plays the same as another due to a large number of variables. Spawn distances, spawn wave times, classes that prefer to take route A over route B, game modes, even area designs before and beyond an area in question all influence the gameplay any location in your map has. It's very common for beginners to produce a map that is humongous, sometimes they get it right on the first attempt and sometimes areas tend to get a little cramped. In the past there has been no definitive answer as to what constitutes acceptable map sizes beyond the fact that each scenario is circumstantial and you should use your common sense to achieve what should turn out to be an acceptable size for map areas. Which of course, is still true. But hopefully this article can go over some points that can help you avoid as many (common) initial gameplay breaking layout issues as possible. Some basic interventions to help build our maps consistently. One can utilise info_player_start's to comprehend scale in Hammer. This can be tricky however as TF2 player models are larger than regular HL2 player models, such as the green reference Gordon Freeman; which can lead to an under scaling of ones map. Alternatively one can place prop_static TF2 class models into the map for a more accurate representation of player size, but this can get tedious trying to find the player models in the model directory, not to mention these will have to be removed later for play testing. Another technique to comprehending your scales is placing a level 3 sentry down and changing its fade distance to 1100 units (its sight range). Selecting it then displays its sight range and its potential effectiveness at area denial. This will also require a search through the model directory. Another more convinient technique is to utilise A Boojum Snark's custom .fgd which replaces the green Gordon Freeman with a custom skin Engineer; making it that much easier to place player references. Do be careful to remove them or disable them in your visgroups on compile as players will of course end up spawning at these locations. Lastly it can be of benefit to use environment props that are well known to you, such as a 2fort bridge component or the badlands spire's perhaps. As it becomes harder to accurately determine area sizes using player models the larger an area gets. 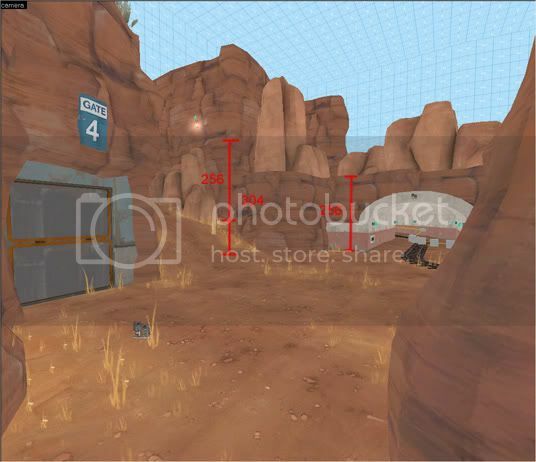 Reference material: vmf's of official TF2 maps. 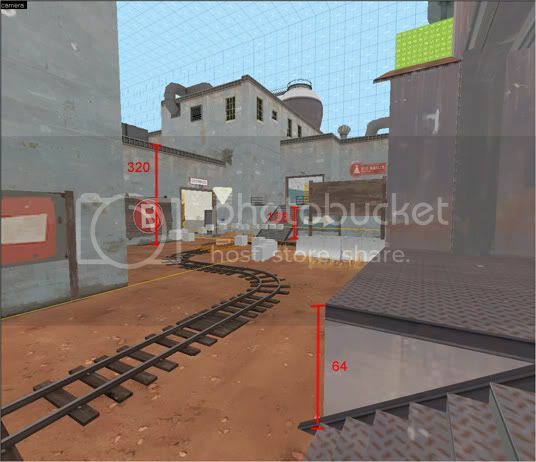 Using existing maps for reference we can begin to grasp what are acceptable limits for distances within a TF2 map. Both in travel distance and sight lines. Since we have played Valve's maps we know how the design of certain maps play out (both successful and unsuccessful parts). Learning from Valve's mistakes and successes is the first step in creating our own successes and hopefully avoiding the same mistakes. We have been provided with a number of .vmf's of official maps in our sdk folder: sourcesdk_content/tf/mapsrc/sdk_prefix_mapname.vmf to do just that. Seeing the maps in hammer for ourselves does significantly help our understanding in how to create reasonably scaled map sections. We should take the scales utilised by valve and referencing our experience of those scales ingame (having played these maps before), noting the figures involved, and move these proven size trends over to our own maps. (I'll include some figures further into the article for your convenience. But don't let this stop you from looking at the .vmf's yourself). Lets talk theoretical figures for a moment so that people can get an idea of predicting gameplay in general. Combat is often resolved at a distance of ~64-256 hammer units. At these distances damage fall off is insignificant so players deal maximum damage to each other. Fights are usually quick to resolve lasting only mere seconds. But obviously fights can start and resolve at further distances; right when players see each other they will attempt to start applying as much initial damage on their enemy before moving in for decisive blows. At about 1028 units damage fall off applies a lot more (halving most weapons damage out put), but these are still hits that can easily cause fatalities, adding up significantly over time. Beyond 2048 units kills tend to lean towards rocket spam, lucky hits on significantly injured players and sniper kills. These figures already hint to the scales we should be using in our maps, anything from 1028 units to 2048 seem to be sensible area sizes for players to duke it out in. But lets look at Valve's maps and take from our own TF2 experiences of these maps to see where our options can take us. Approximate area of play sizes in Hammer units. potential sight across bridge: ~ 2816. From our experiences of these locations we can tell how combat plays out at certain distances and begin to predict combat in our own map before we even create it in hammer, as well as start to purposefully apply certain sizes and scales to dictate certain player experiences at specific locations. This capability to anticipate and influence gameplay allows us to create epic objective scenarios that players will enjoy fighting in. Which will keep players coming back to your map every time. We should be considering these stats right from the start, when we plan our layouts on paper. Hopefully, as a result, our first map test should reveal an interesting layout with successful, fun gameplay. But given all the variables it is still possible for many anomalies to occur in gameplay that will require modifications of your layout to resolve said anomalies as it develops. 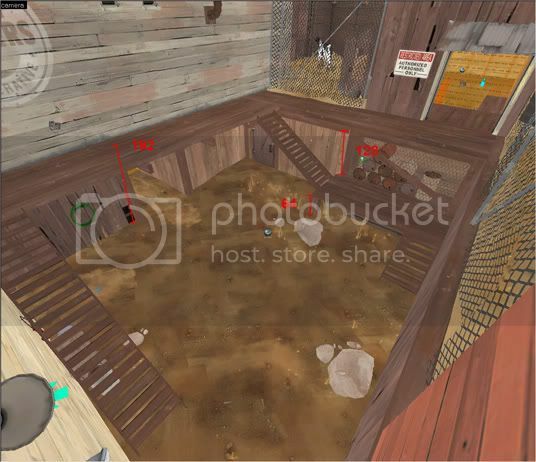 Due to class and weapon mechanics, and largely a result of weapon damage falloff, combat for TF2 occurs in very close quarters. Frequently around corners and choke points like doorways. The sniper class however is something of a unique class in how he performs (IE headshots at long ranges and no damage falloff for the sniper rifle). The wider and more open your map is, and the longer distances players have to traverse to engage the sniper, the more efficiently he will perform. In order to balance all classes, particular care must be taken for balancing sight ranges for the sniper class. If you test your map and snipers and scouts become the class of choice this is one way to realise there is a distance and sight line issue in your map. Introducing cover is one way to include larger than average total area sizes in your map, whilst still limiting sight lines. Cover can have multiple benefits for your map. It gives players more tactical options, allowing them to make one sacrifice for another benefit (ducking for cover reduces damage recieved but also increases the time it takes you to get to the enemy and complete objectives). It is also an excuse to add more detail within your map boundaries. Rocks, cargo containers, concrete blocks or corrugated iron sheets... any sort of "junk" can manage to cut sightlines and interupt open space that would otherwise make for boring gameplay. Additionally, it provides more oppotunities to optimise your map, particularly when implementing the larger pieces of cover such as whole structures or solid walls or cliffs that can block vvis and reduce render loads for computers. Keeping area sizes small helps to keep them from becoming too excessive in details and content, allowing older computers to run your map efficiently. This is generally something considered in the pen and paper layout phase, implementing doorways and corners to control sight for both players and vvis. If a particular sightline is too much however, then don't hesitate to interupt that sight line with a (preferably theme relavant) object. The staging area of badwater shows us it is not always necassery to implement solid structures to control sight lines. Inevitably it will, though, as the low ground in Badwater was well designed, allowing the peak of the hill to reduce sight of the far end of this area. Rocks and varying heights are used to reduce fields of view on top, but eventually solid structures are used to provide neater twists and turns and more strictly control vvis patterns. So far I've discussed scale on the X and Y axis, but what is just as important in TF2 is scale on the Z axis. TF2 has a high focus on vertical combat. Ambushes from above and below, rocket and sticky jumping in particular all influence the out come of combat. So how do vertical scales affect our maps playability? Well, the greater the height advantage the greater the chances of successfully killing ones enemies, as well as increasing the chances of ones own survival (depending on class and weapon selection of course). From an aesthetic and ease of development point of view it's sensible to stick to a 64 unit grid size (which is also Valve's personal recommendation), sticking to a simple grid size allows for easier modifications to your layout further down the road, should feedback dictate that need. This inadvertently means working in unison with the texture scale. Giving clean aesthetic results since textures are created to a 256/512/1028 scale, the same scale used by the world editor. 256 is a significant number in the vertical scale because it is not only the scale of most textures, it is the maximum height you can fall without taking damage. This itself hints to us as to the intentions for height limitations in TF2, if we are taking damage from drops of 256+ hammer units, it would be prudent not to exceed this height for playable areas in our map. Lets take a look at some well experienced tall drops in official Valve maps. The drop on the left is 256 units high, because of the fence it is necassery to jump over it in order to drop to the area below. This means players will take fall damage. The drop itself is rather excessive but is generally excused because of the final objective. The drop on the left again garauntees fall damage, whether you jump or not, because it is over 256 units high. The height means it grants a lot of cover at its edge for those using the high ground, increasing the chances and capacity for players on that high ground to take less damage, but still granting the capacity to rain down damage to those below. These heights are also rather excessive. The greater than normal distances between players (regardless of the fact it is vertical) also affects your damage falloff, reducing damage done for both sides. This is why it is also sensible to not make excessive heights, doing so limits the amount of damage and increases the chance for players to dodge projectile weapons. Combat becomes drawn out and generally not as fun. Jumping off the 2fort battlements causes fall damage, walking off does not. This can be eratic however, depending on whether you land on a raised or lowered section of displacement. RED's base front is notorious for this and such scenario's need to be considered for balance purposes. Just some figures at this key location in 2fort. So, what should i do about heights in my map? Out of personal experience 192 is a great height to utilise as it does allow for the space below it to be used if need be, and comfortably at that. The average door height is also 192 units high and provides just enough room for combat in rooms; any lower and explosives tend to pin players against the ceiling which can be frustrating as you cannot move to escape from or advance on enemies. 192 units height also removes fall damage for players jumping from this high ground. At this height it provides a significant advantage but still allows players below to fight back sufficiently, so that they don't feel cheated in combat. 256 is a good standard height too, which, as the same scale for most textures, syncs your aesthetics neatly. Since players generally learn from deaths, and take appropriate tactical actions to increase survival and/or the chances of making more kills, if the environment is the cause of a lot of their deaths (rather than a better player) they will learn to avoid that area of the map altogether. You can call this an imbalance. Additionally, heights exceeding 256 hammer units start to affect weapon damage falloff. Unless you are a sniper, actually engaging in combat would largely be a waste of time. hit scan weapons are effectively 'nerfed' with significant damage falloff and projectile weapons become increasingly easy to dodge. 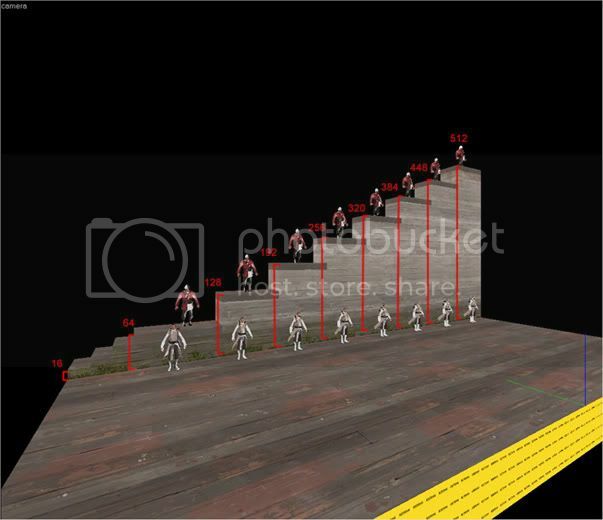 16 units is the maximum height players can walk up although steps tend to be 8 units tall. 64 units can be crouch jumped onto, but is a comfortable height to gain and fight from. 128 is also a comfortable height to fight from. what are nice about these heights are that players can still feel like they are engaged in the combat, rather than being shot down on from the heavens. 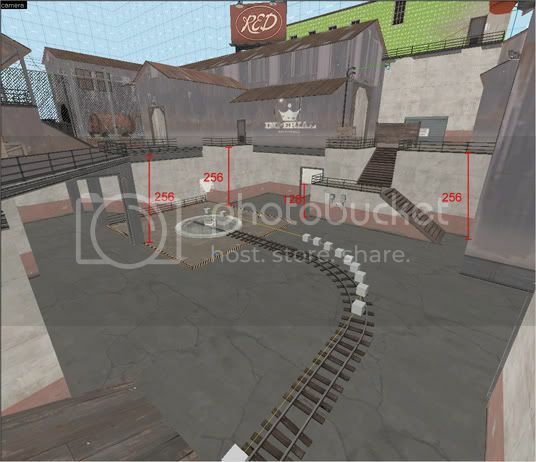 If it wasn't for the narrow gaps in 2fort's battlements which focus cover fire, the 256 units of height could seriously effect the ability for teams to even enter the enemy base, let alone get to the intel room and return with the intelligence, which is often considered a feat in itself. recognisable environment props such as 2Fort's bridge, Badlands spires or even the metal control point plates. Do not test your map as scout. Scout is a significantly faster class than the rest, which will make it a desirable class to chose in order to quickly scout your map for problems before a public release. This will however warp your perspective of journey distances and even scale in general. Test as a number of classes, soldier is a good first choice as you are slow, but can also test rocket jumps and double check health and ammo placements at the same time. Decent open area sizes can range from 1028 to ~2600 hammer units, inside areas can range from 256 to 1028 hammer units or more. Sentry guns have a range of 1028-1100. Use this to determine areas that engineers will likely set up at (in combination with ammo drops). Always consider more than just the immediate area. A distance of 2048 units is significantly different ingame than a 2048 distance with a decent sniper spot at the end. It affects players attention from other players, their movement habits and the chances of players successfully advancing from that route as opposed to another. All affecting the ability for one team to anticipate the moves of the other and come out on top. The ability to weigh in the affects of each addition to a map area is something that just comes with experience in both playing TF2 and seeing ones own maps play tested. Where have you been last 2 years when i needed this :O Cookies for you. This will be handy for every new and experienced mapper. Blocking out the layout was always a problem for me so this helps a lot. haven't read it yet but thanks. The main problem I have is scaling issues, always too big. EDIT: Read it, it's a good article. I tend to have large open flat areas, I tend to underestimate the size in hammer in comparison to that in game. I think if I compile more often to check it could help. It's only recently that i've been quoting my own experiences for players asking about appropriate scales, particularly after having done the A/D tutorial. What with TF2maps growing so much i find myself repeating myself more and i figured it might be sensible just to make an article and link people to it. This; but I make it too small. Actually that's not bad that you wrote this guide right now, it was quite fun learning scales by myself. Maybe a little suggestion, If you have time maybe you could tell about Gravelpit scales? Ok, i'll include that data as soon as i can. I forgot to mention about cover and optimisation so i'll try and add this stuff in asap (tomorrow morning). This bit makes me feel a lot better -- I've been using 192 units for my vertical baseline and worrying quite a lot about what I'd have to do if it ended up not being a good idea. I added 3 paragraphs on implementing cover (what seemed relavent at the time), as well as commenting on optimisation in the process. Is it too long winded though? Sometimes i go into more depth than people care for. I also provided some quick links to my other tuts at the bottom of the post as well as including the gravelpit data. I'm certain that the minimum height you have to fall to recieve damage is 288 units. So if you drop 256 units you receive no damage but if you jump off you will. The TF2 wiki claims it as 260 units. Although the TF2 wiki has proven to not always be infallable, it does seem accurate given experience with 2fort's battlements. walking off the 260 drop doesn't always cause fall damage, but occasionally on the red side (which has more "noisey" displacements in front of its base) you can receive fall damage by just walking off, depending where you land. It's an issue that has been braught up several times by players, to Valve, amongst other issues (spiral doorway height can be blocked by dispenser in one base but not the other (don't know whether this was actually fixed yet, there was a 2fort update recently)). But yes, as i mentioned in the guide jumping from a height of 256 units will cause fall damage, whilst walking off does not. This has been known to agitate some players. Great piece, highly useful and informative- as always. Thanks, now that i look back on this article for some reason some of the jpg's compression has ruined legibility of some of the text... i could have sworn it wasn't like that when i published this. I'll try and fix that in the next couple days. + Woops, i totally forgot to add links to this article from my others and it's probably the most useful!! Fixed that now. Good read, even though I don't really see the benefit of listed area dimensions, compliments for the hard work though. Horizontally, I find it most helpful to visualize the distance, so I think any screens of a room that's 512x512, 256x256, 384x384, so on would be really helpful. Vertically, what could be called 'base height' I refer to as floors. I think it's important to emphasize the creation aspect more then the existent aspects of height variation. Better phrased, while Valve maps are helpful, I think it's important to stress finding comfortable heights yourself. For example, in the Badwater screenshot. I consider 256 units to be a 'tall floor', or a 'tall wall'. I like to use this for anything where the height should be subtly taller then the standard height (64 units higher). In the badlands screenshot, I would guess, or hazard a guess that valve made it 320 (256+64) because 384 was too high, but 256 wasn't high or dramatic enough for such a powerful wall/roof height. I feel that putting more emphasis on an almost itemization of heights (128 is a very low wall, 192 is an average wall height, 256 is a high wall, so on..) could be more helpful, because I feel that this sort of itemization plays a more important role in the creation of maps, then previous example.. This is pretty much covered in the hammer screenshot with the soldier and the medic. People can see for themselves what consitutes too much or too little height whilst referencing scale from the Valve map screenshots i've provided here to their own in game experience, so that they can replicate certain experiences accurately in their own maps. In terms of itemisation of scales, this is related to texture scales and the Hammer's grid structure, which i have already covered. But what i felt was more important to bring to the table was scales relationship to damage fall off and fall damage, as this more directly dictates what constitutes too much height/distance. We can see this demonstrated by the over use of scouts, snipers and sometimes soldiers in our play tests, which are the least affected classes in terms of damage fall off. Be it through weapon mechanics of maneuverability. Better phrased, while Valve maps are helpful, I think it's important to stress finding comfortable heights yourself. I think you're overlooking an important point, the point being that Valve maps have already gone through rigerous testing; unlike the maps we would be in the process of making. These "official" maps have been tested and proven to result in enjoyble experiences, which is why we consistantly see these scales across all the Valve and Community maps. It stands to reason then that you would find the scales Valve have utilised across their maps as comfortable, just like the play testers who give their seal of approval before each release. If you don't then you can see the scales for yourself here and respond appropriately, be it increasing or decreasing certain area scales to better fit your preferences. The purpose of the tutorial was that people can come here to assimilate relavent data in anticipation of their maps performance. Rather than going through a tedious and time consuming process of trial and error, but pre-emptively getting a generally acceptable scale and then tweeking there after in response to feedback. It can take a map several versions before it gets the most important feedback it needs to bring it to acceptable gameplay standards, the most fundamental of which being scale. you forgot the part where if you cant jump twice as high as a ledge as soldier its probably too high and if it takes you more than one sticky to get across an area its probably too far. Well, many of the newer A/D maps require 2 stickies to acquire maximum distance coverage, especially the payload race maps. 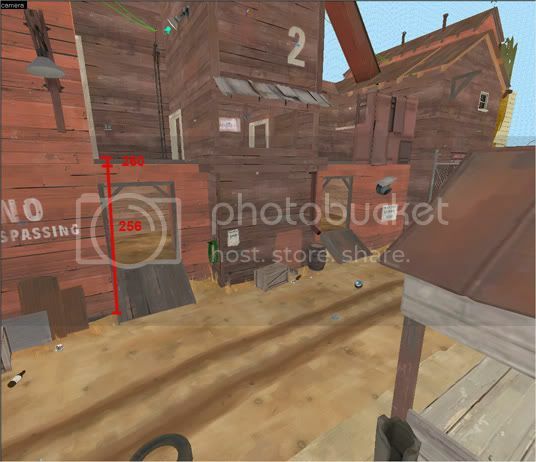 Whilst older maps like dustbowl, where 1 sticky is enough to clear the immediate area, are considered too small. Depending on the maps design will inform an authors discretion on what is acceptable air space/linear distances and how much to control/limit a classes abilities. If a particular flank is sufficiently strong enough there is no need to go out of ones way to allow the demomen the benefit of a 1 sticky jump total area clearence. Though it is a good standard to try to stick to for the sakes of being safe. But your former statement goes without saying. This is a must read for new mappers, had I read this before I started my map (my first one) I could have saved a lot of time. Also the cover is relevant, because it explains that just because a map has a big opening it doesn't necessarily mean that it must be toned down. Also the Valve Developer Community says the max height w/o fall damage is 269.